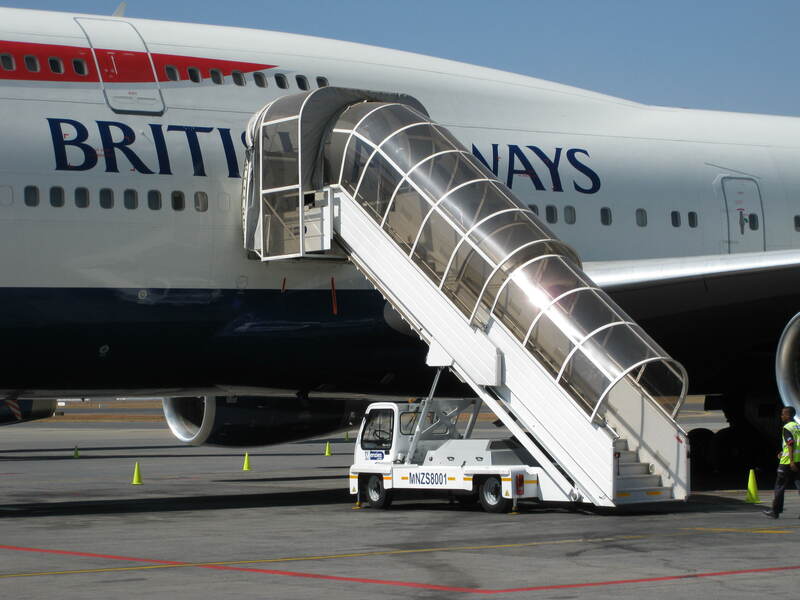 This self-propelled passengers stair provides access under the best possible conditions of safety and comfort for passengers of narrow, medium and wide body aircraft with a door sill height between 2,20 and 5,80 m. The stair is a telescopic stairway type and its height may be adjusted step-by-step allowing the passengers to embark and disembark in total comfort. The extruded-aluminium steps have a highly efficient non-slip surface, offering additional safety, anodised handrails and bright stairway lighting. All driving and aircraft approach operations are carried out from the cabin, which, thanks to its all-round glazing, provides perfect visibility of aircraft. These operations are carried out under the best conditions of safety and comfort. 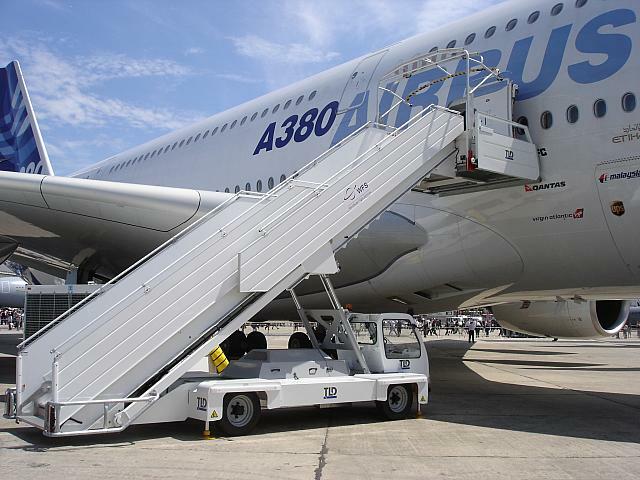 This self-propelled passengers stair provides access under the best conditions of safety and comfort for passengers of narrow, medium and wide body aircrafts with a door sill height between 2,20 and 5,80 m. The stair is a telescopic stairway type and its height may be adjusted step-by-step allowing the passengers to embark and disembark in total comfort. The extruded-aluminium steps have a highly efficient non-slip surface offering additional safety, anodized handrails and bright stairway lighting. 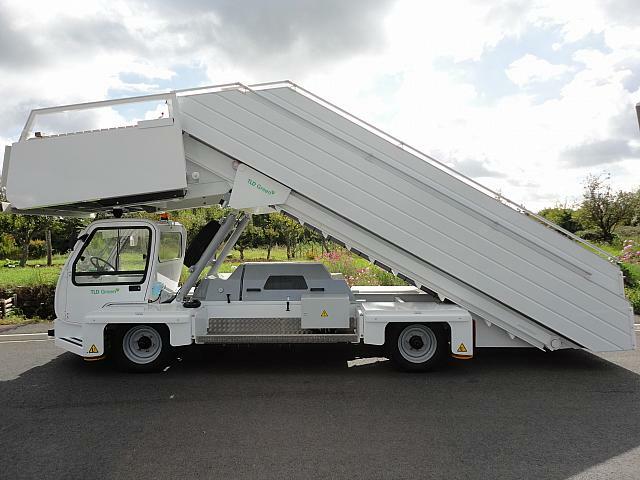 All driving and aircraft approach operations are carried out from the open driving station (option Driving cab), which provides perfect visibility of aircraft for boarding. 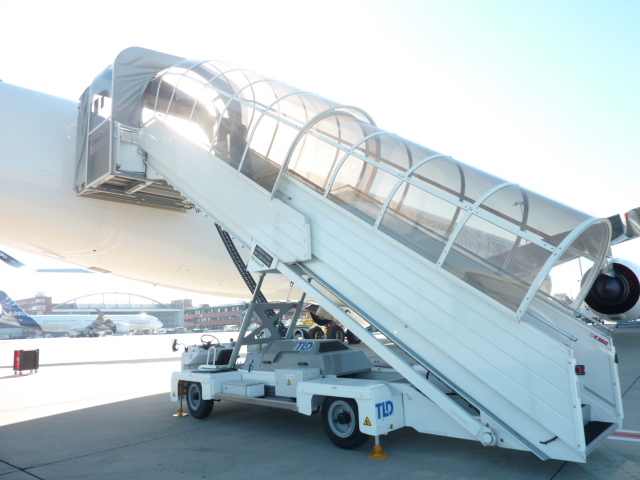 The ABS-2045 Aircraft Passenger Boarding Stair is designed for servicing aircraft with doorsill heights between 2000 and 4500mm. 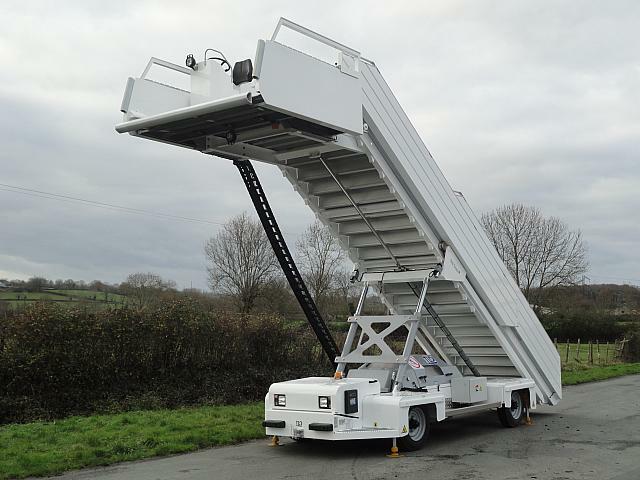 Stair assembly is mounted on a self-propelled chassis with diesel engine and automatic transmission. Four straight down type stabilisers located at front and rear to provide maximum stability and prevent rocking of front platform. ABS-2045 uses the latest technology with simple electric and hydraulic circuits. Location and accessibility of all components have been designed to reduce maintenance time to a minimum. 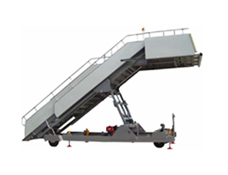 The ABT-1740 is a reliable and low maintenance cost towable Aircraft Passenger Boarding Stairs designed for enplaning/deplaning passengers to/from an aircraft parked in the airport apron area. 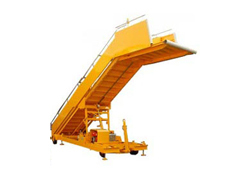 The stair assembly is mounted on a towable chassis and consists of a pivoted lower flight and a telescopic upper flight. The stair can be tilted and extended to achieve the best elevation in its working range. 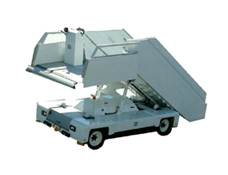 The unit has four (4) hydraulically-operated vertical stabilisers to provide stability. Mechanical restraint devices are provided to prevent the stairs from lowering and retracting. A mechanical parking brake is automatically applied when the tow bar is lifted. 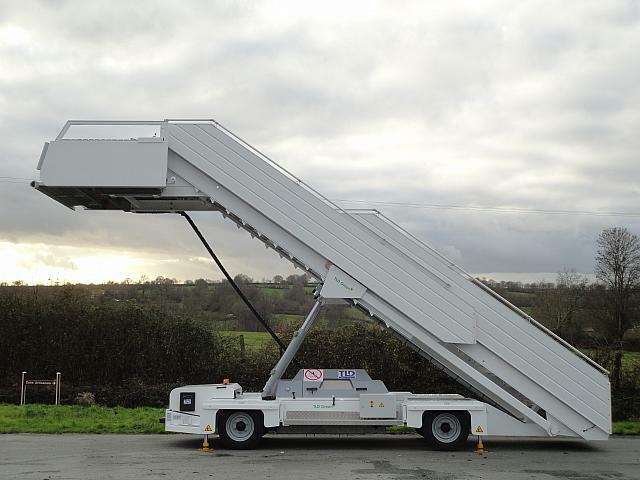 The ABT-2045 is a reliable and low maintenance cost towable Aircraft Passenger Boarding Stairs designed for enplaning/deplaning passengers to/from an aircraft parked in the airport apron area. 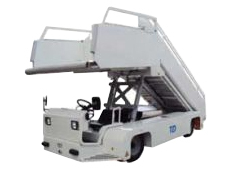 The stair assembly is mounted on a towable chassis and consists of a pivoted lower flight and a telescopic upper flight. The stair can be tilted and extended to achieve the best elevation in its working range. 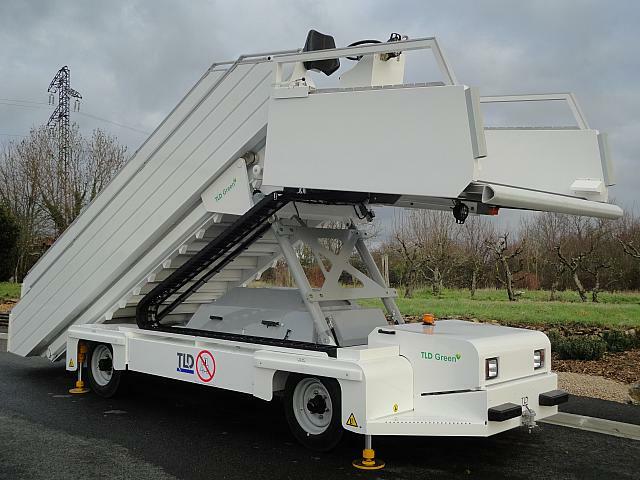 The unit has four (4) hydraulically-operated vertical stabilisers to provide stability. Mechanical restraint devices are provided to prevent the stairs from lowering and retracting. A mechanical parking brake is automatically applied when the tow bar is lifted. 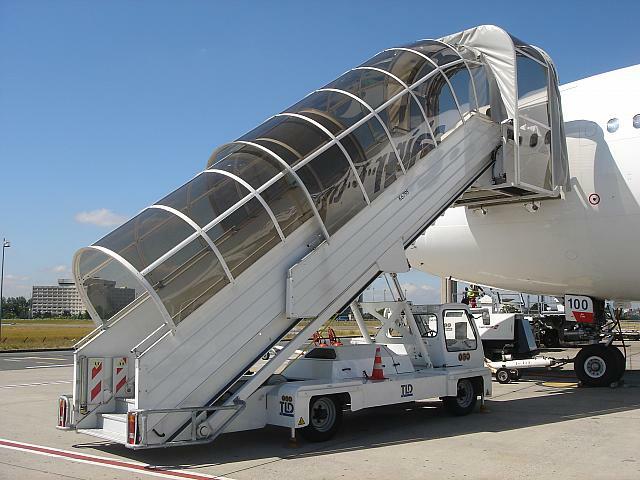 This self propelled passengers stairway provides access under the best possible conditions of safety and comfort for passengers of narrow, medium and wide body aircraft with a door sill height between 2,20 and 5,80 m. The stair is a telescopic stairway type and its height may be adjusted step by step allowing the passengers to embark or disembark in total comfort. The extruded-aluminium steps have a highly-efficient non-slip surface, offering additional safety, anodised handrails and bright stairway lighting. All driving and aircraft approach operations are carried out from the control panel located on the top platform, ensuring the operator has total all-round visibility. These operations are carried out under the best conditions of safety and comfort. 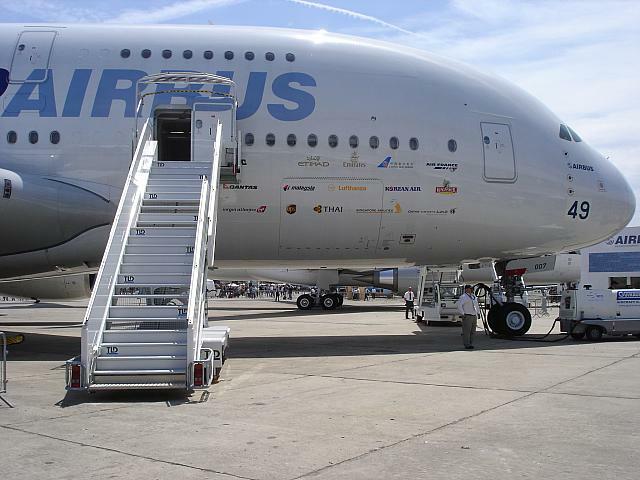 This self-propelled passengers stair provides access under the best conditions of safety and comfort for passengers of narrow, medium and wide body aircrafts with a door sill height between 2,20 and 5,80 m. The stair is a telescopic stairway type and its height may be adjusted step-by-step allowing the passengers to embark and disembark in total comfort. The extruded-aluminium steps have a highly efficient non-slip surface offering additional safety, anodized handrails and bright stairway lighting. 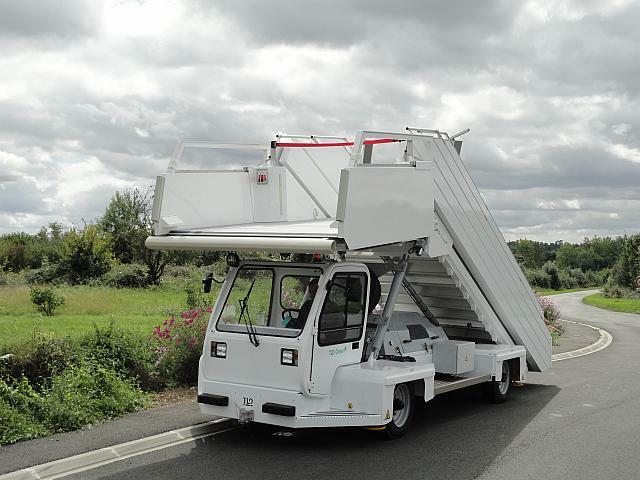 All driving and aircraft approach operations are carried out from the open driving station (option Driving cab), which provides perfect visibility of aircraft for boarding.